The Newport Pagnell Historical Society was formed in 1984 and houses its collection at the town museum at Chandos Hall in Silver Street. Amongst its artefacts is an oil painting donated by the late Miss Catherine Bull a descendant of the Bull family, local solicitors in the town for over two hundred years. 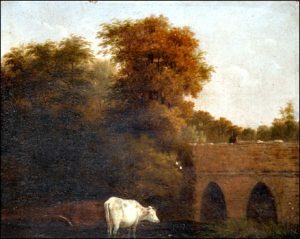 The painting of the North Bridge over the Great Ouse on the road that leads to Bedford and Northampton was painted by Edwin Wombwell. Edwin Edward Wombwell was born in 1802 at Stoke Newington, Middlesex and by the 1850’s unmarried was residing at Newport Pagnell when he was described as a painter and restorer. He only ever took board and lodgings and in 1861 lived at Wolverton at the Plough Inn, then a widower and artist. He was known to have painted local landscapes and several pub signs one of which was the March of Intellect, depicting a chimney sweep playing a piano and on the reverse a very competent painting of the Rotherhithe Tunnel. This pub sign ended up in Bournemouth in 1951 and would be a great find if it still exists. Wombwell returned to Newport Pagnell by the 1880’s then calling himself a landscape artist and known locally as “George Wombwell”. Edwin Edward Wombwell died in 1885 and is buried in the Parish Church cemetery. 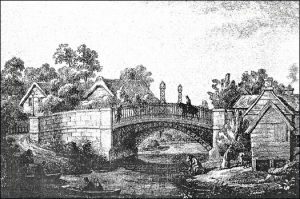 A sketch of Newport Pagnell’s famous Iron Bridge dated circa 1820, only a few years after the bridge was constructed in 1810. This sketch looking down- stream towards rivers meet (where the Great Ouse meets the River Lovat) shows on the right the business premises of the Yates family who were fellmongers and also kept a tannery by the bridge. The family established their business in the 18th century.